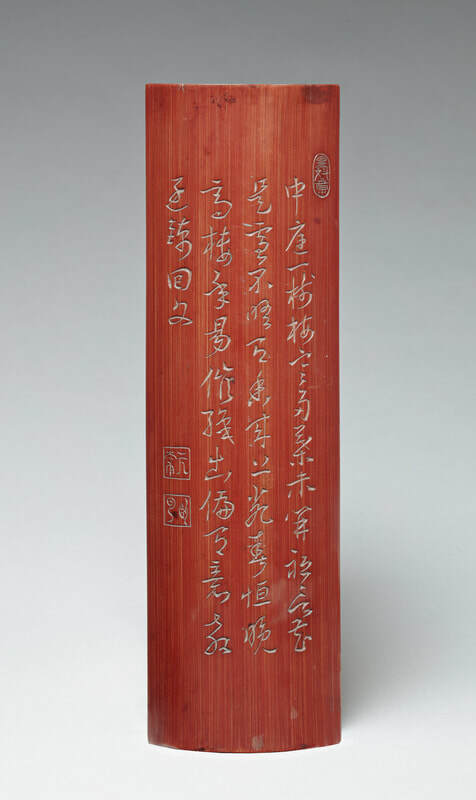 A curved bamboo wrist rest deeply incised with four lines of calligraphy, a poem composed by Su Ziqing 蘇子卿from the Chen dynasty (557–589) of the Southern (Six) Dynasties, with three seals: one on the upper right in an oblong reserve read as Ri Sandou Wenzhan日三斗文章, and two on the left in square reserves read as Yuanchang元常(upper) and Woyun臥雲(lower). The reverse is carved with chamfered long sides ending at a slightly extended rectangular foot on each corner. China. Qing dynasty, 19th century. 中庭一樹梅，寒多葉未開。 In the middle of courtyard stands a plum tree, with its leaves not yet budded due to the cold. 祇言花是雪，不悟有香來。 I mistook the blossoms for snowflakes, for I did not noticetheir fragrant scent. 上亂(郡)春恆晚，高樓年易催。 The spring in the upper quarter always comes late. 織書偏有意，教逐錦回文。 [Ascending to] the high pavilion one easily feels the elapse of time. [A wife] wove verses in tapestry with deliberate design, which impelled [the husband] to unravel the hidden palindrome.